Indian cuisine stands for scrumptious taste and appetizing colours! There are people who prefer every dish to be hot and spicy whereas on the other hand there are families that prefer bright red colour but mild taste. Sometimes managing the perfect balance between the taste and colour becomes tough… and thus, Gajanand has come up with a novel product – Gajanand Reshamlal. As an answer to the demand of the customers, this product has been developed by the experts and connoisseurs of taste! After stringent quality checks, the company has launched this product in the market. 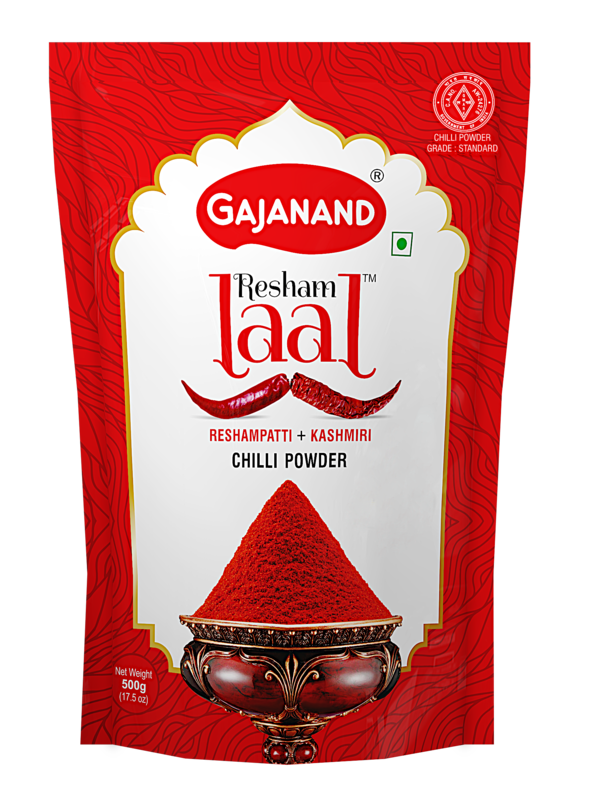 Gajanand Reshamlal is a perfect blend of Spicy Reshampatti Chili and Bright Red Kashmiri Chili, prepared after thorough research to give the consumers a perfect and ideal balance of taste and colour! Gone are the days of buying different chilli powders for different requirements! Now bring home Gajanand Reshamlal, get rid of health problems like acidity and add magic to your cooking! Copyright © 2015 by Gajanand Foods Pvt. Ltd. All right reserved.